2015 was a big year for climate action. In August, President Obama and the EPA announced the Clean Power Plan, limiting carbon pollution from U.S. power plants for the first time in our history and demonstrating a serious commitment to addressing climate change and its impact on human health. Rounding out the year, COP21 resulted in nearly 200 nations adopting the first global climate action treaty. Looking ahead, 2016 promises to build on this progress with three emerging trends in climate action in the health care sector. During COP21 just this past month, an unprecedented alliance of doctors, nurses, and other health professionals representing over 1,700 health organizations, 8,200 hospitals, and 13 million health professionals came together to call on governments to reach a strong climate change agreement that protects public health. The health sector also committed to leading the way toward climate solutions, promoting low carbon health care, climate resilient health systems, and health care leadership in support of policies that combat climate change. Capitalizing on this momentum, a new paper from Kaiser Permanente’s Tyler Norris and the Democracy Collaborative’s Ted Howard explores how “all in for mission” is the emerging health care model. Health care’s role in creating healthy communities is being complemented by a higher impact approach: hospitals and integrated health systems are increasingly stepping outside of their walls to address the social, economic, and environmental conditions that contribute to poor health outcomes, shortened lives, and higher costs in the first place. Addressing the social determinants of health through climate leadership will have measurable impacts on the health of the communities we serve, and will continue the trajectory of health care leadership beyond Paris. During the COP21 climate negotiations in Paris, France, Dignity Health announced it is selling off its assets in thermal coal companies, expanding sustainable investments, increasing its use of renewable energy, and reducing its greenhouse gas emissions. Dignity decided to screen out coal from its portfolio because the not-for-profit system’s mission encouraged executives “to recognize the impact of climate change as a prominent public health issue” and “to limit our relationships with the worst environmental offenders,” Shelly Schlenker, Dignity’s vice president of public policy, said in a statement. Dignity’s mission-based investment leadership is an example for other health care leaders to follow in alignment with the Hippocratic Oath. Climate change is the greatest public health opportunity of the 21st century, and health care leaders can capitalize on this opportunity by ensuring that their investment policies proactively support our stated mission to First, Do No Harm. Mobilizing C-suite leadership on sustainability and climate leadership is essential, but it is by no means the full story. While it is true that top-down approaches to engaged leadership can create lasting, robust sustainability programs, this is only one side of the equation. Embedding sustainability into the culture of the organization drives lasting impact. Integrating grassroots, bottom-up approaches to sustainability leadership programs foster a culture of sustainability that enables everyone in a health care organization to be engaged. 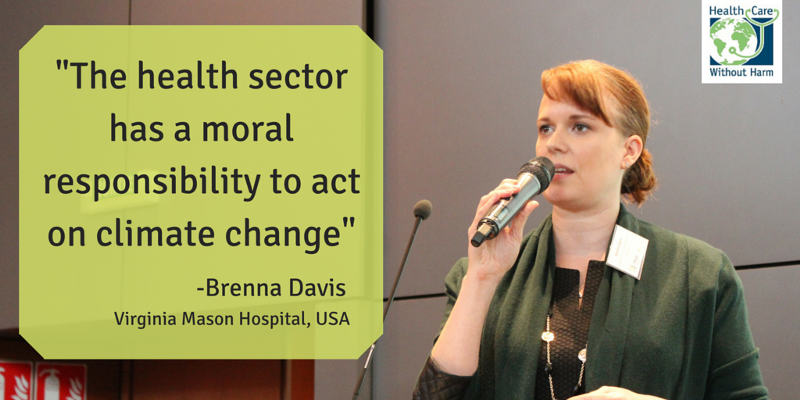 Health care leadership is having a significant impact on conversations around climate action. In the coming months, we can expect even greater momentum around climate action from health care leaders, especially in the areas of engaged climate leadership, mission-based investments, and engaging employees in sustainability initiatives. As a recent demonstration of health care leadership, this past week, the U.S. Supreme Court issued a stay on the Clean Power Plan, effectively putting a hold on improving the health of our communities. This prompted a unified response of disappointment from the Health Care Climate Council, and a renewed commitment to reducing climate impacts, moving toward renewable energy sources, and supporting the goals of the Clean Power Plan. In the words of Margaret Chan, Director General of the World Health Organization, “climate change will be the defining issue for health systems in the 21st century. Health professionals have the knowledge, cultural authority, and responsibility to protect health from climate change.” 2016 promises to build on this leadership around climate action. By Christina Quint, U.S. Communications Assistant, Health Care Without Harm. Learn more about Health Care Without Harm’s Climate and Health Program.